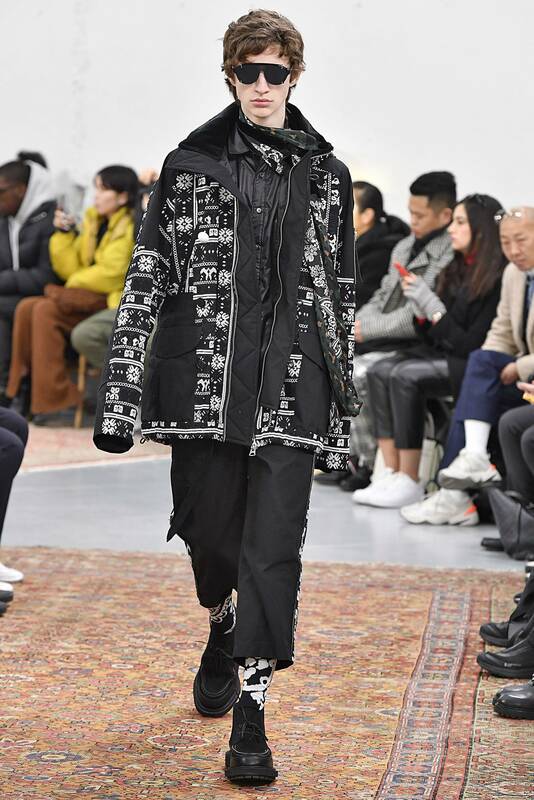 Applying the notion of a cultural melting pot to sacai’s signature hybrid splicing, mixing references freely and with ease. 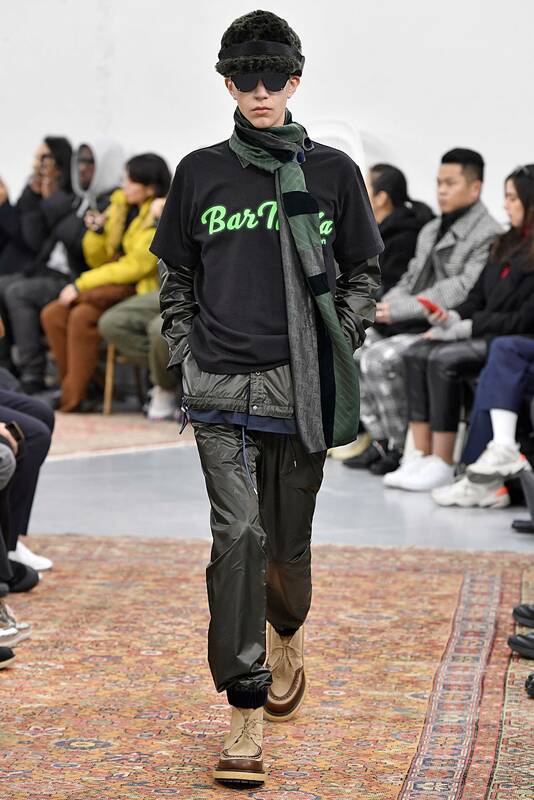 Celebrating togetherness and “freedom of being” that’s symbolised by experiences in London’s legendary Bar Italia – the setting for exchanges and social cross-pollinations, with no boundaries self-imposed by a need for tribal belonging – and applying that mindset to familiar clothing archetypes. 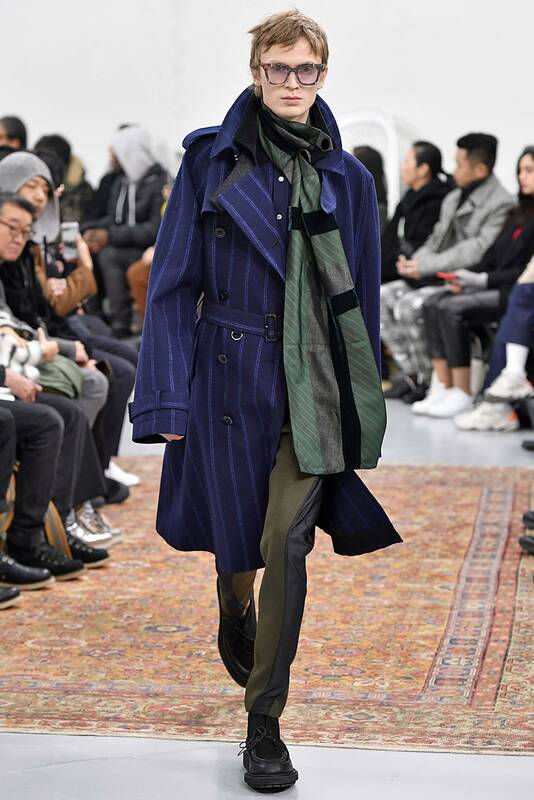 A sharper take on menswear. 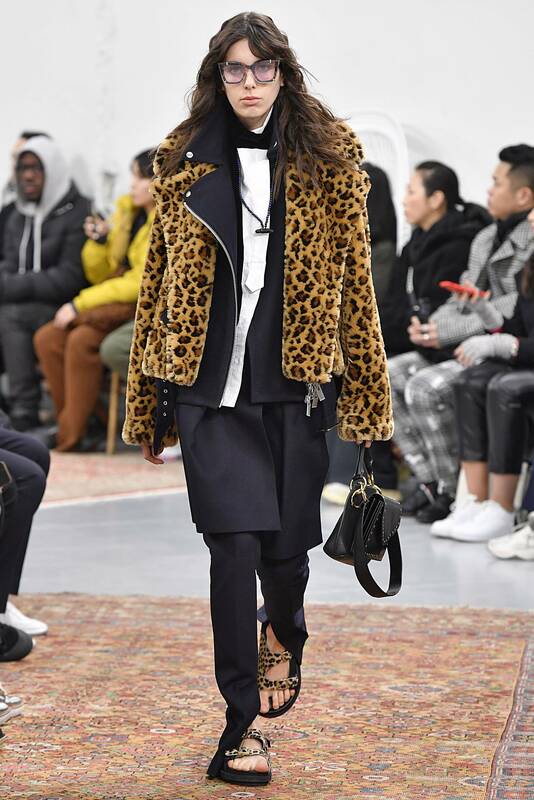 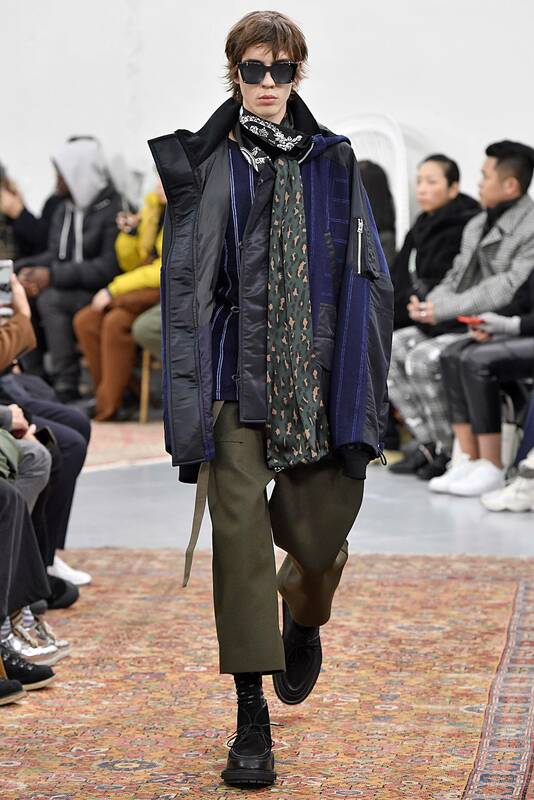 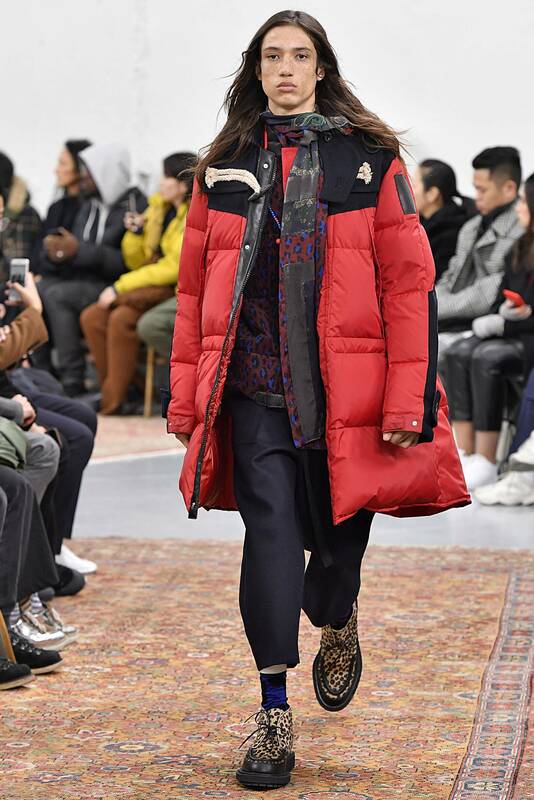 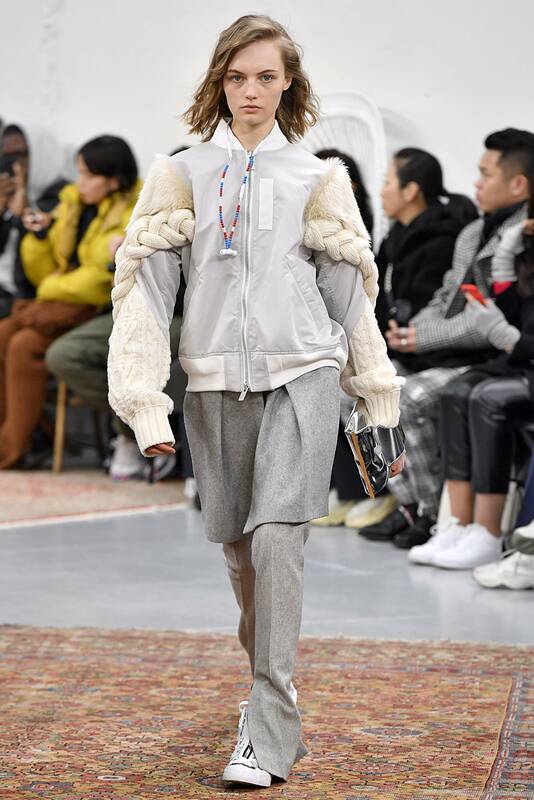 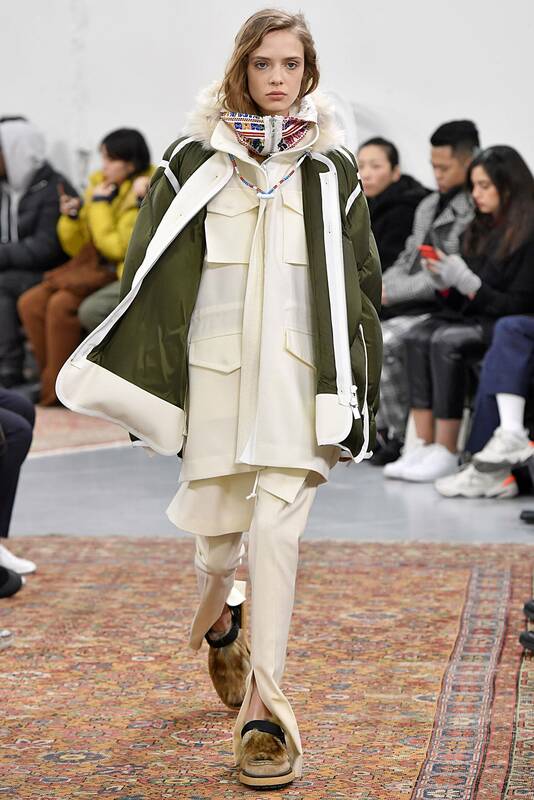 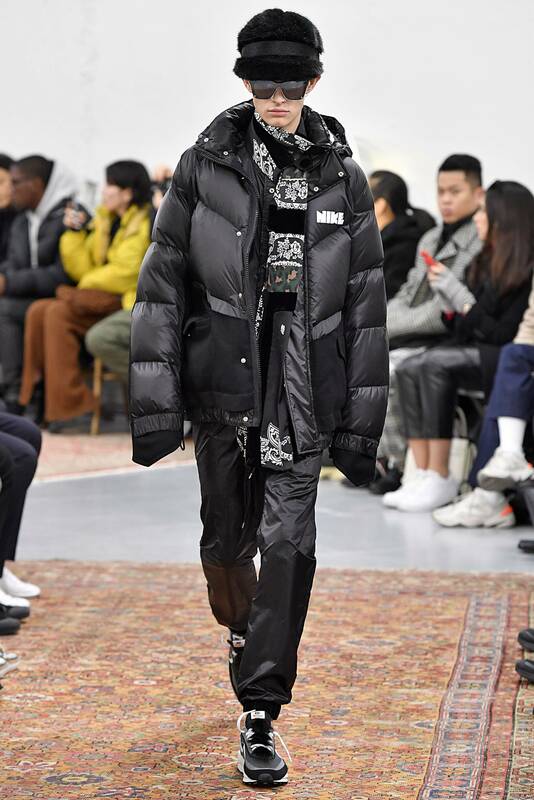 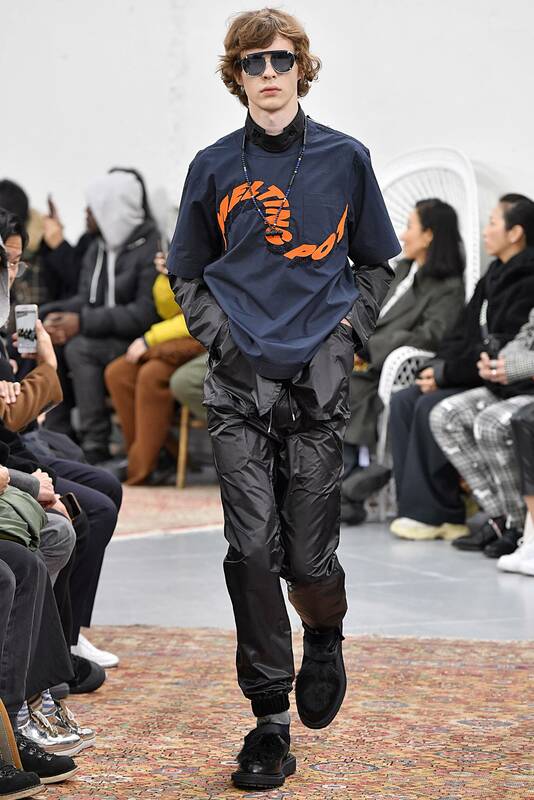 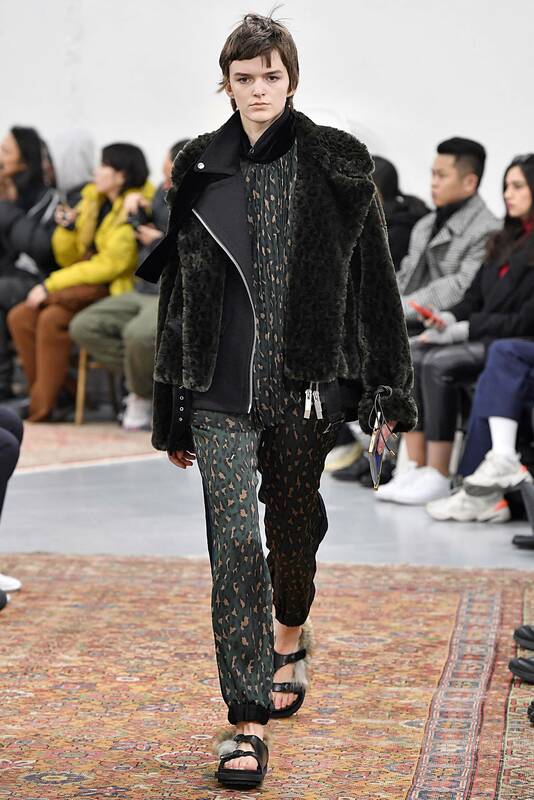 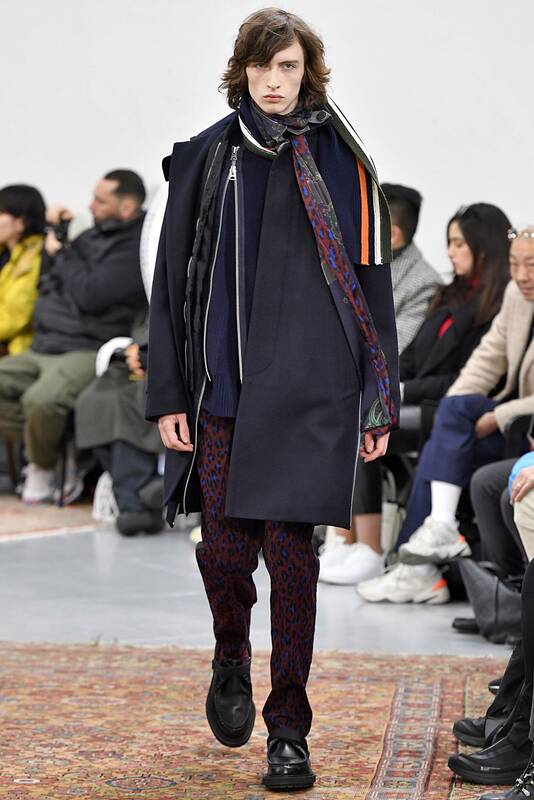 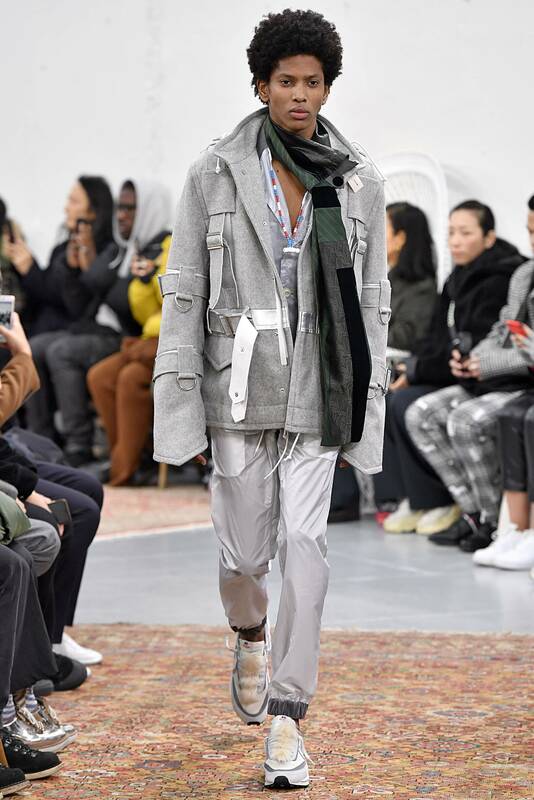 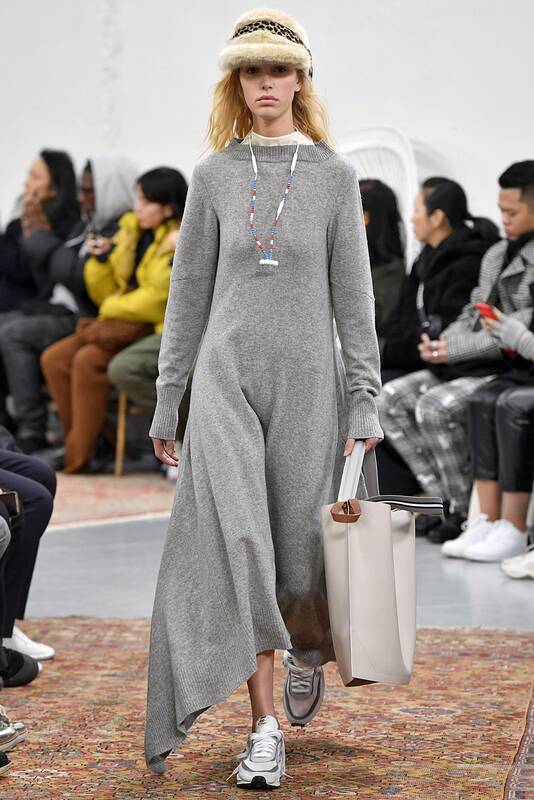 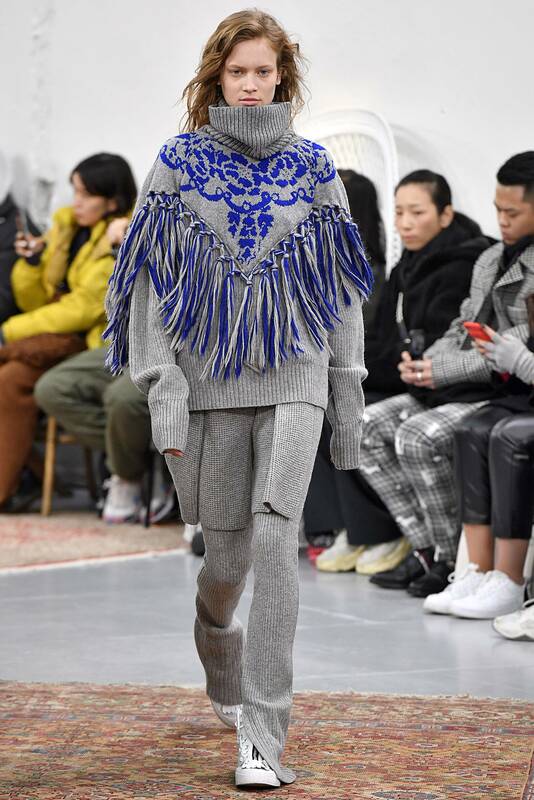 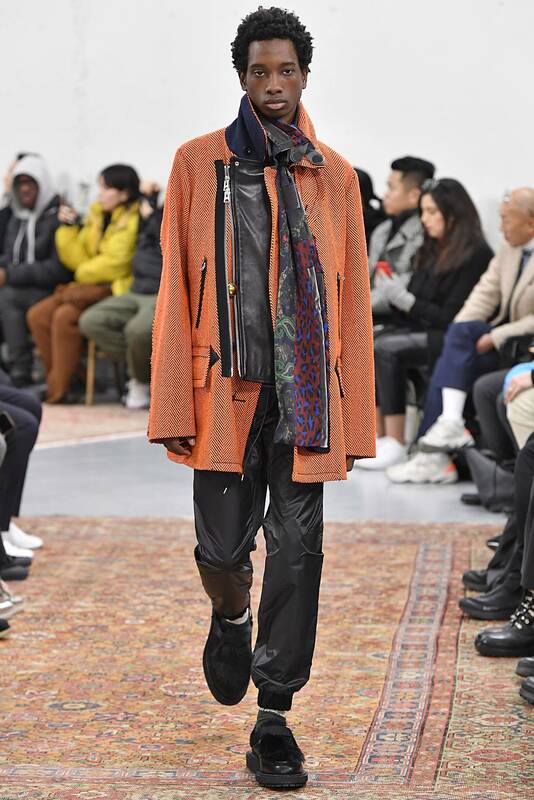 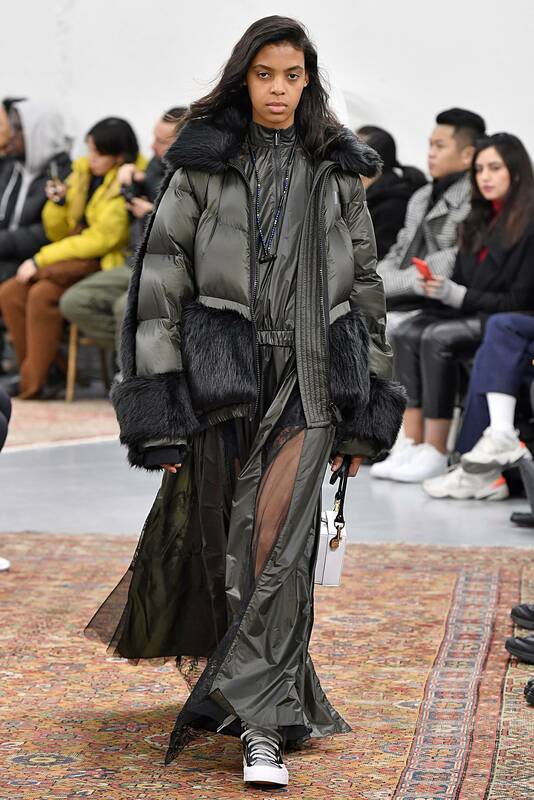 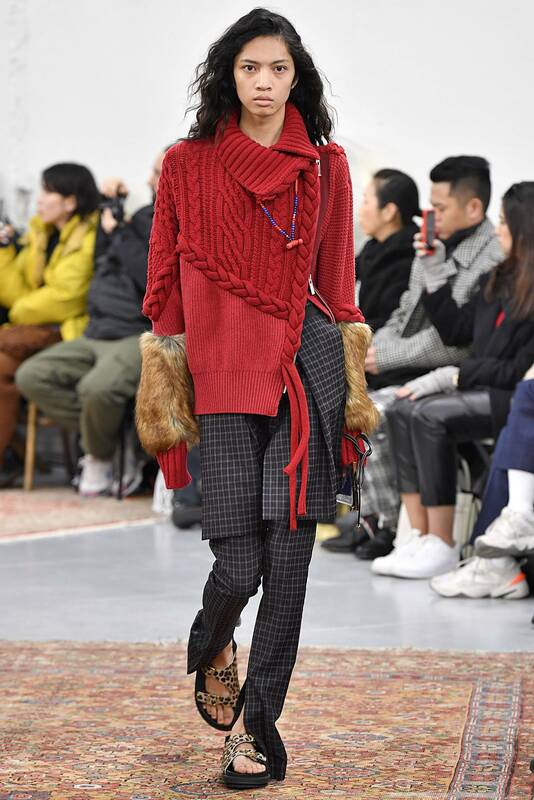 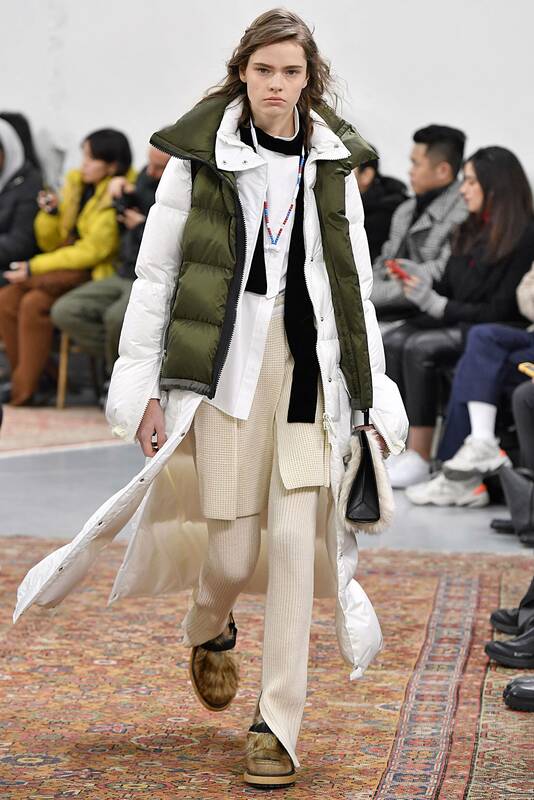 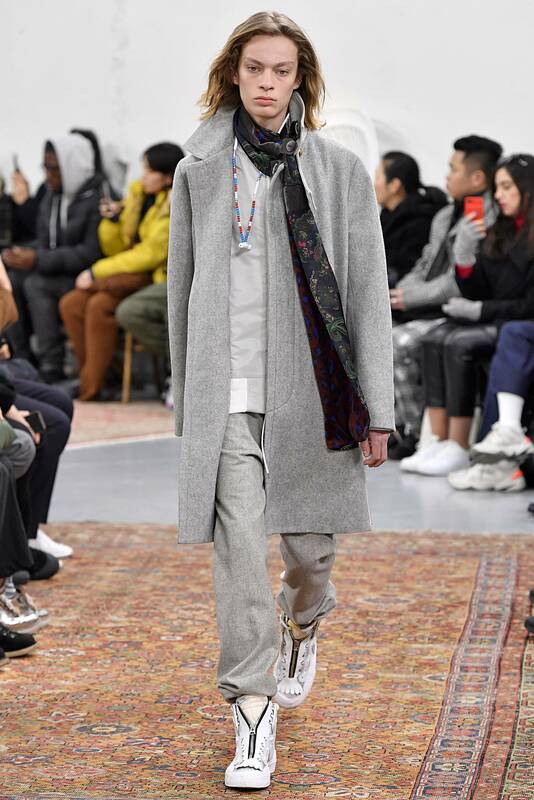 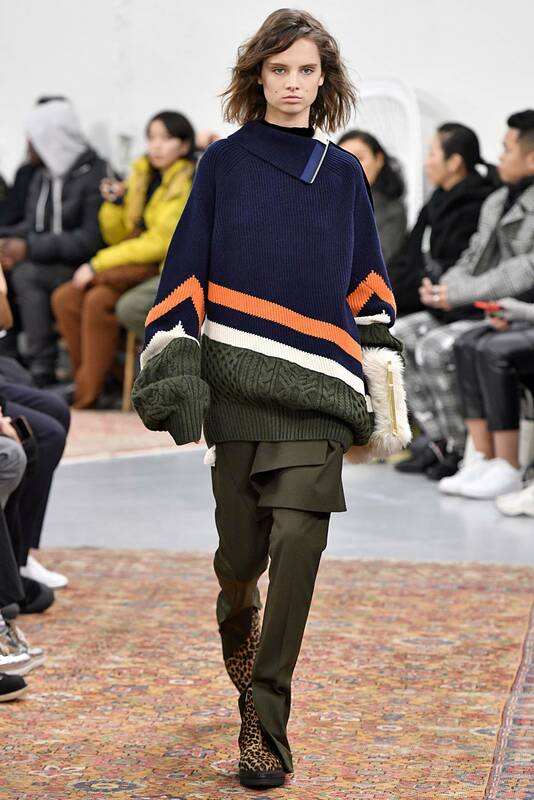 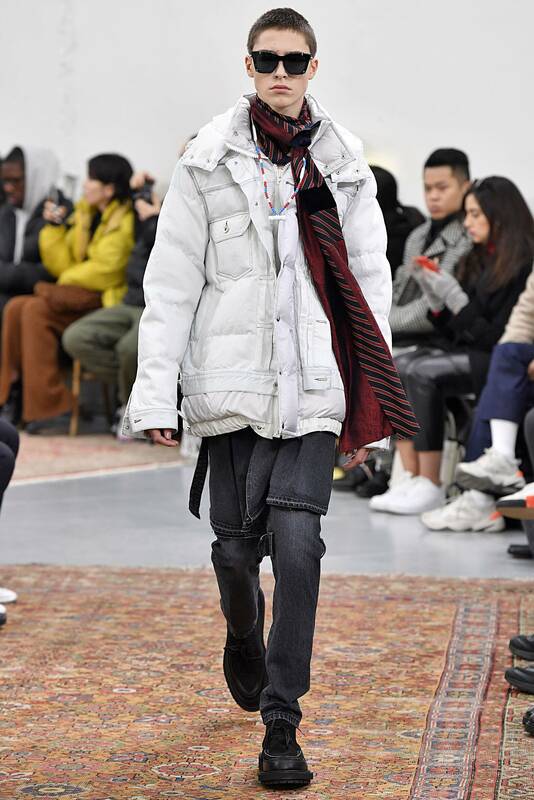 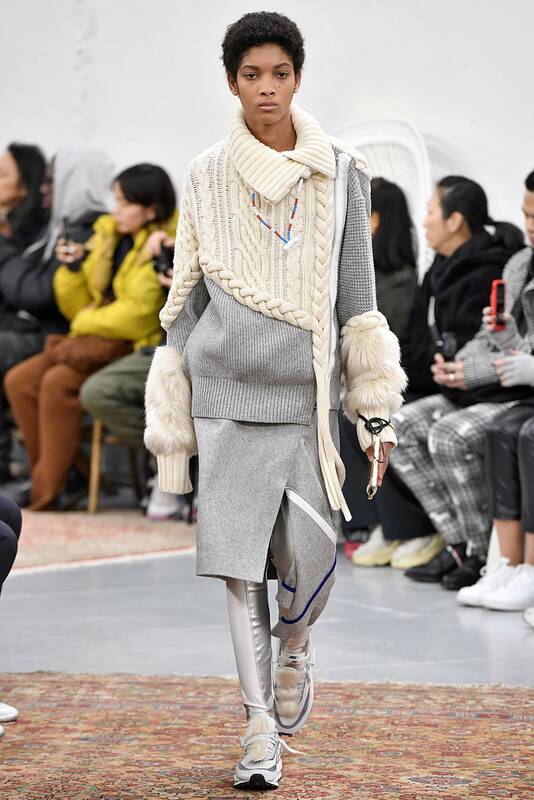 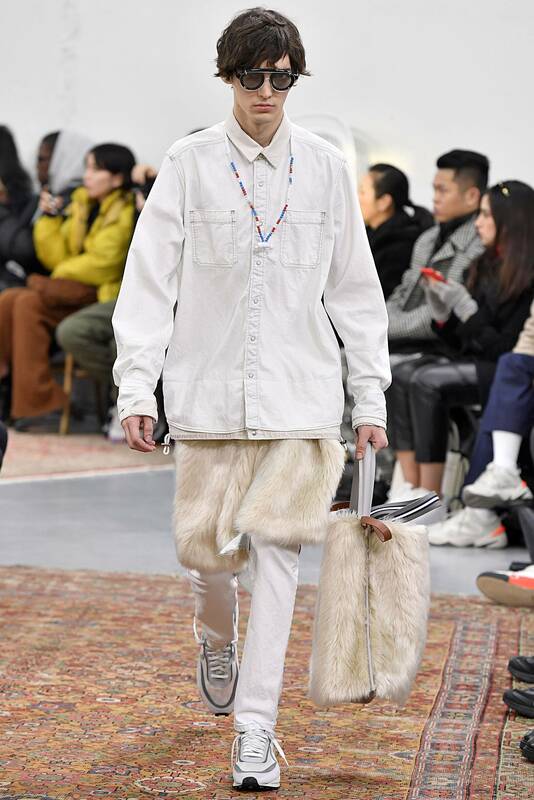 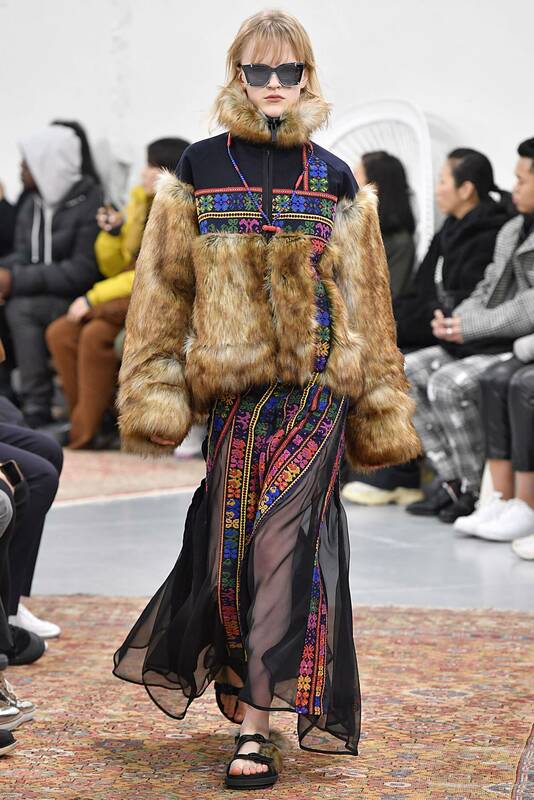 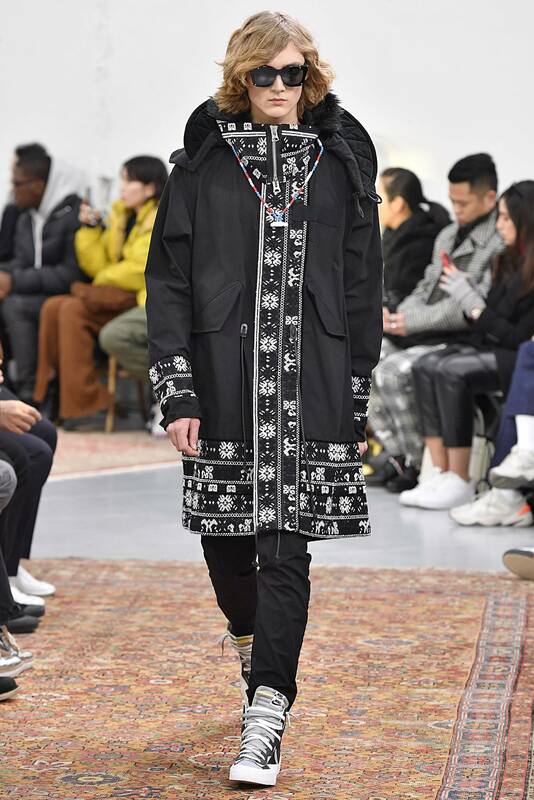 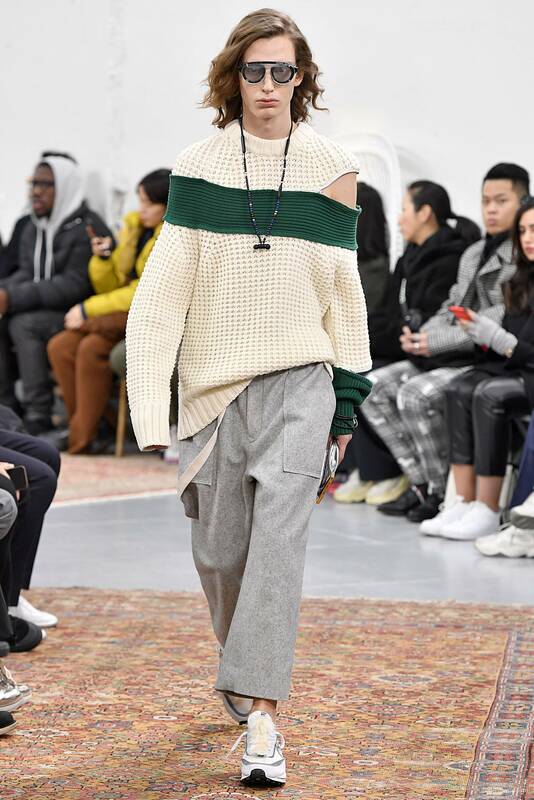 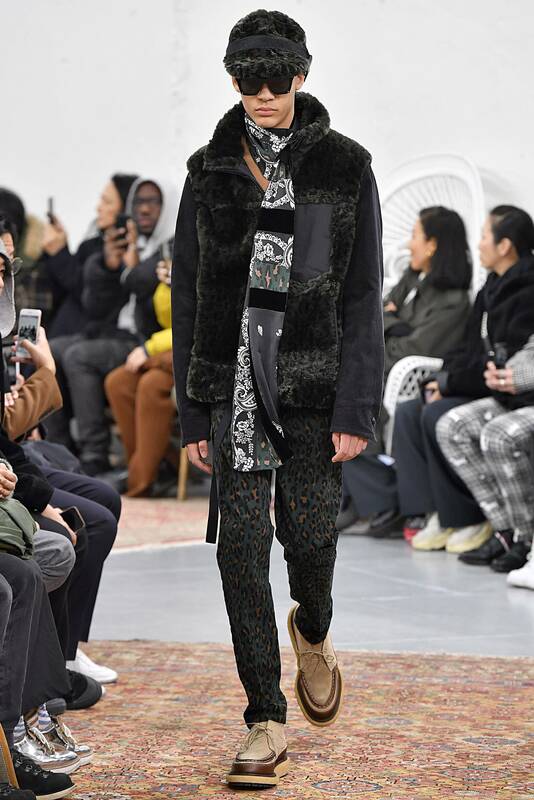 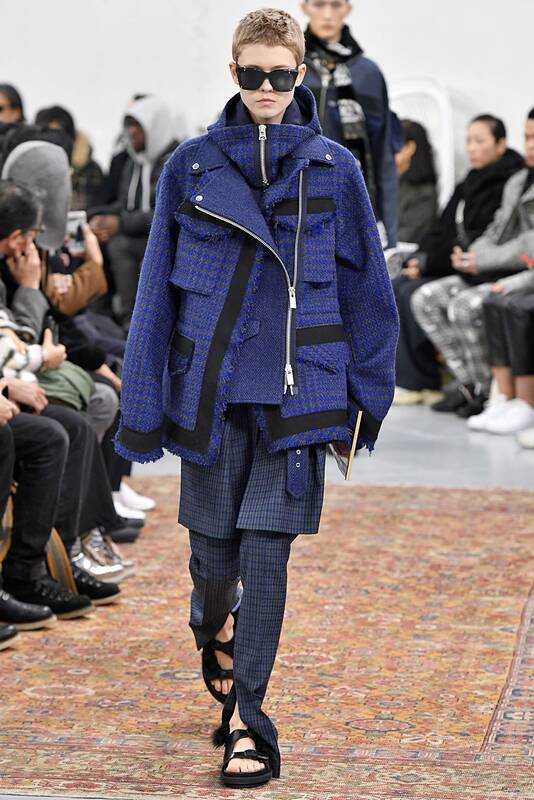 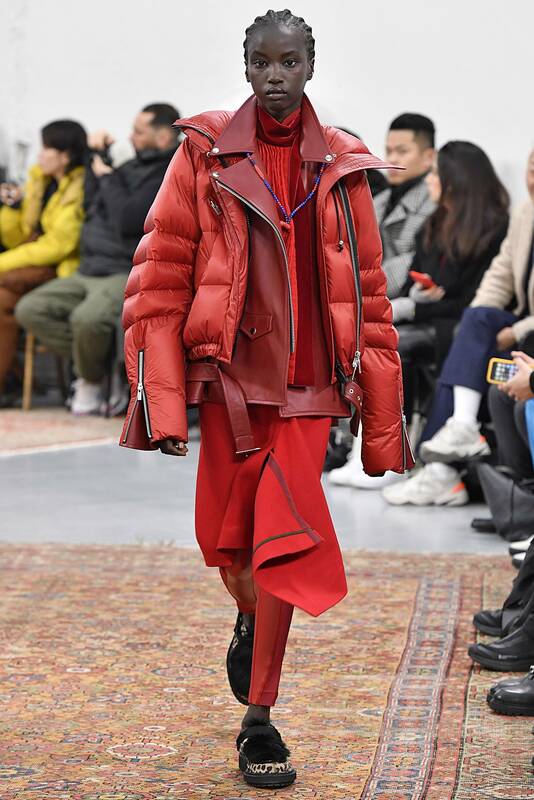 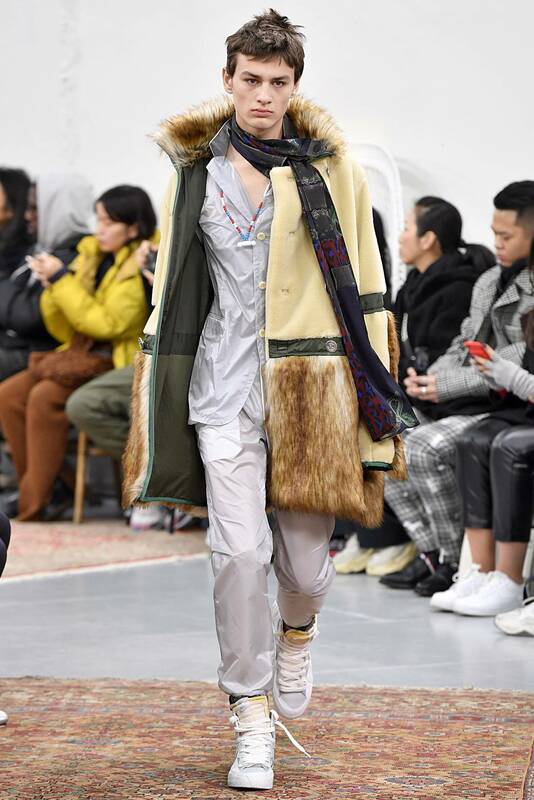 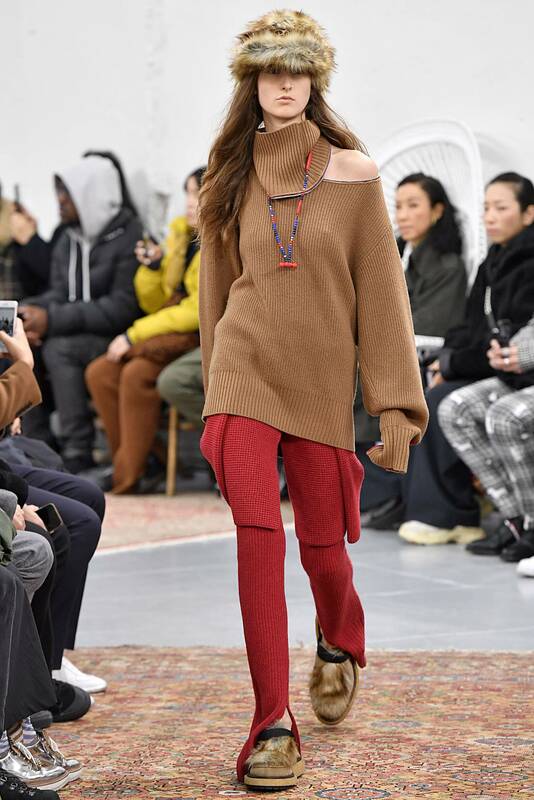 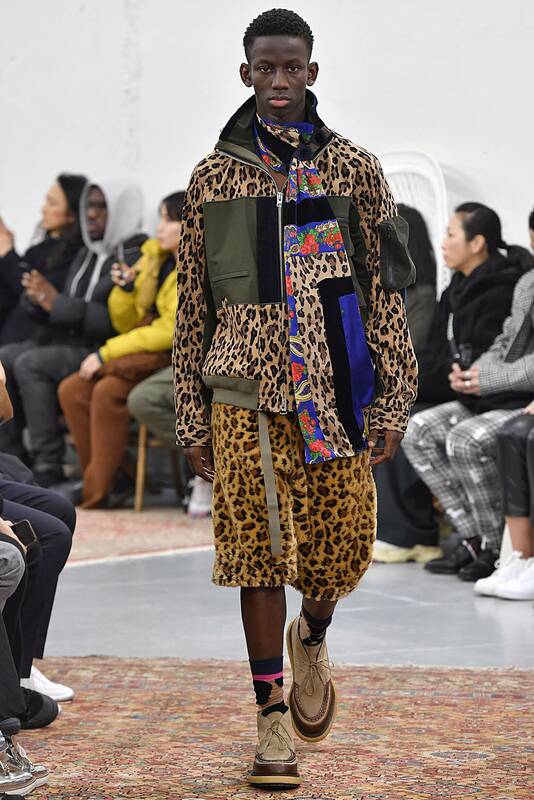 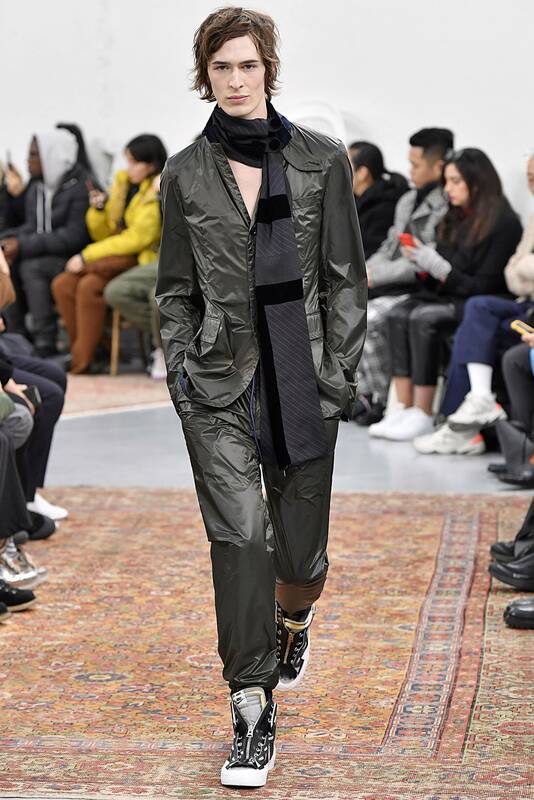 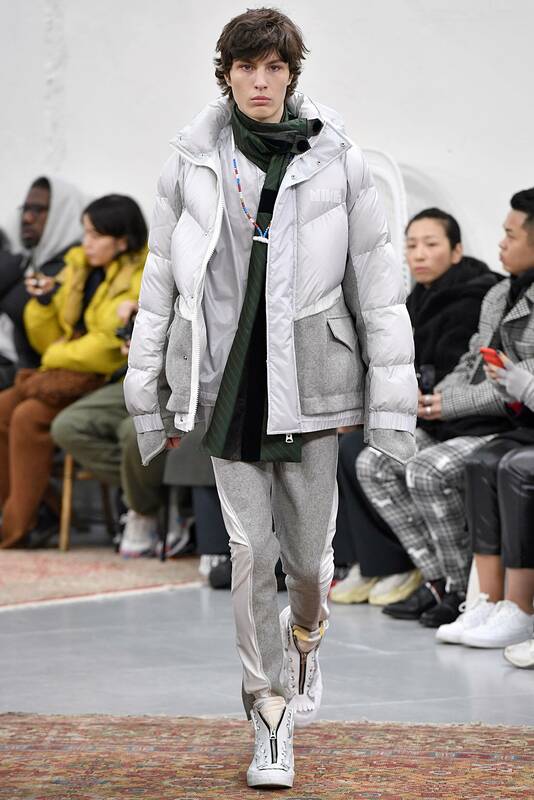 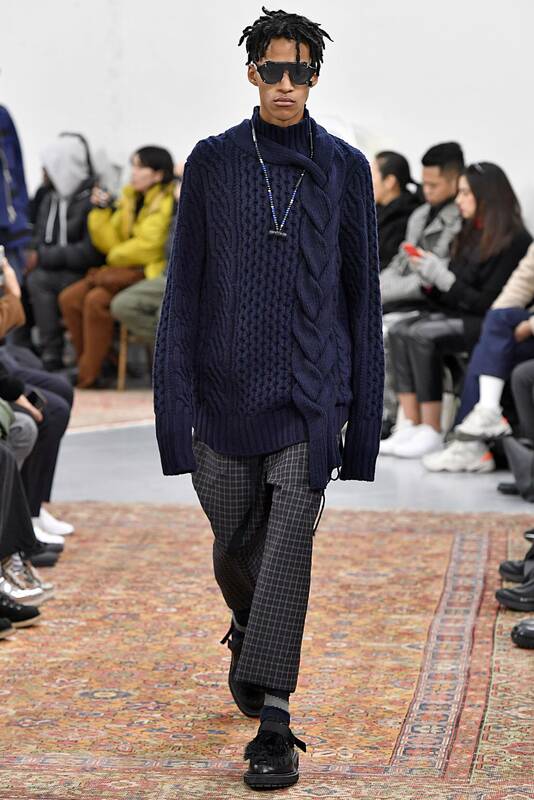 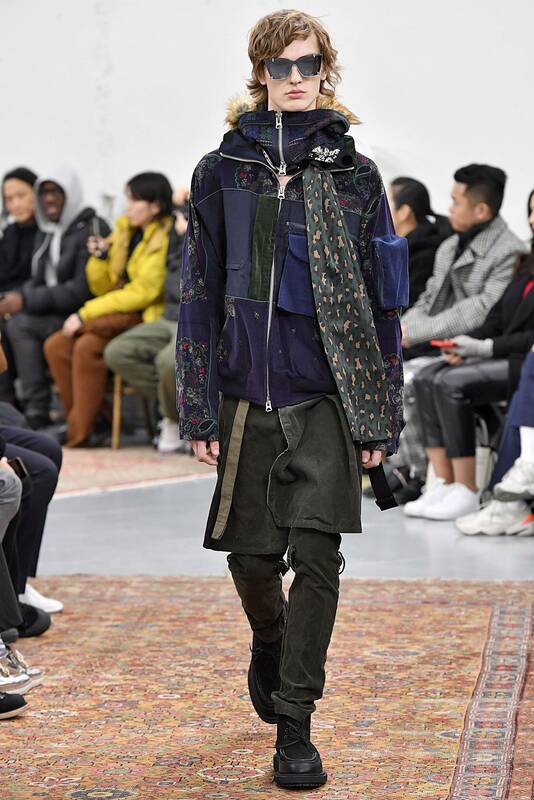 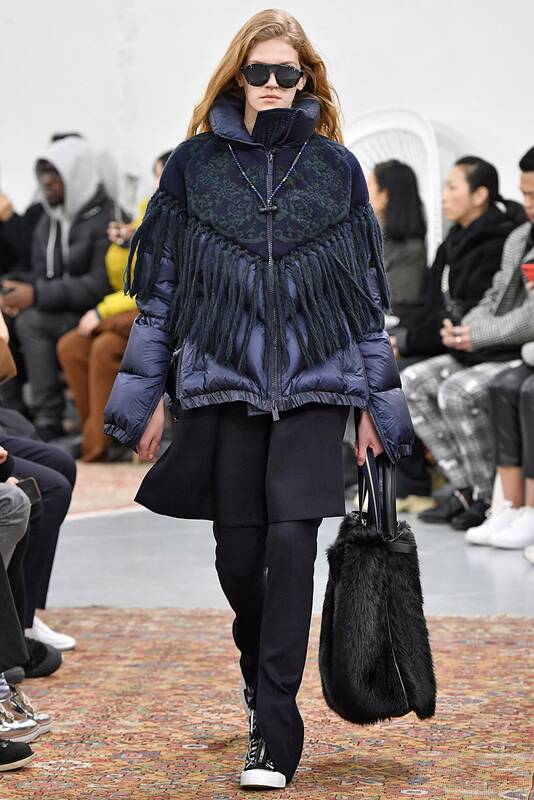 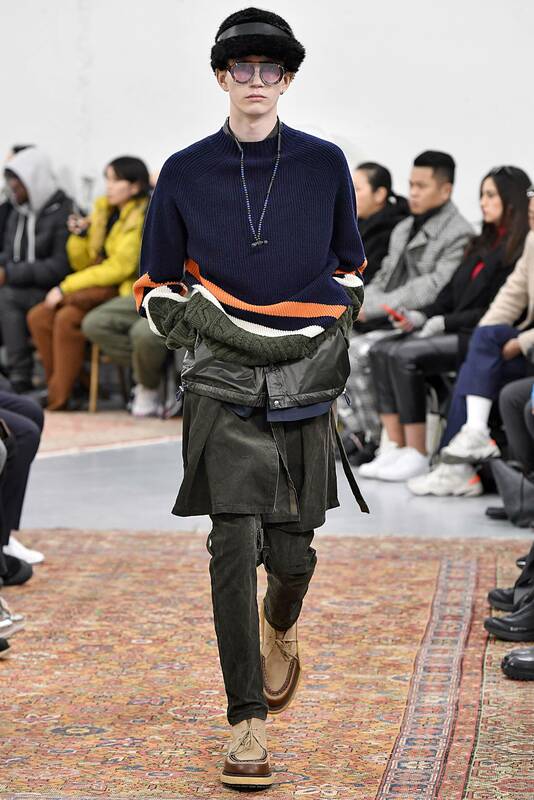 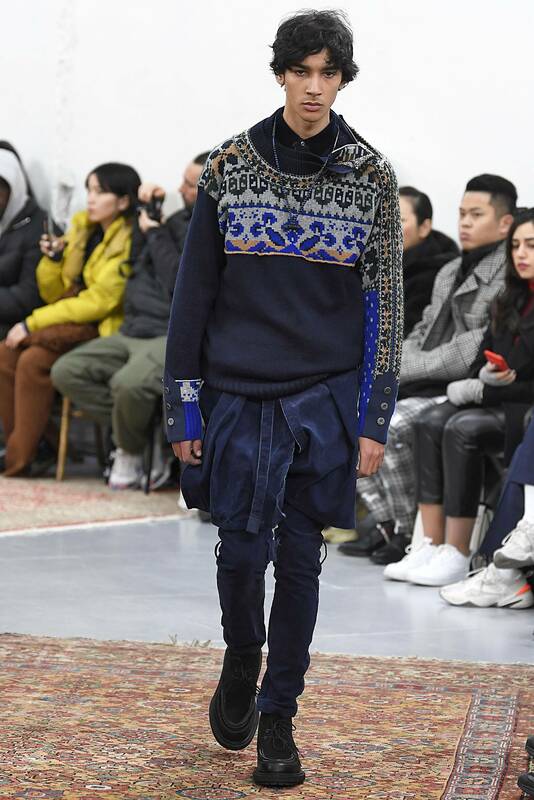 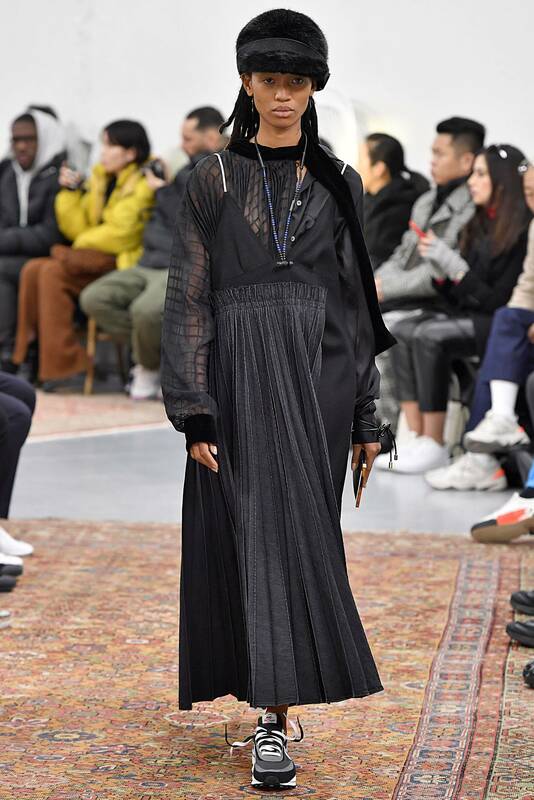 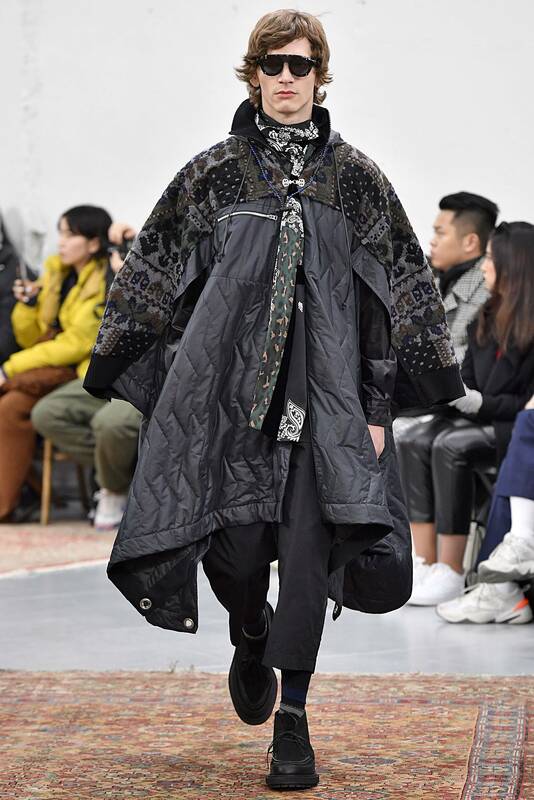 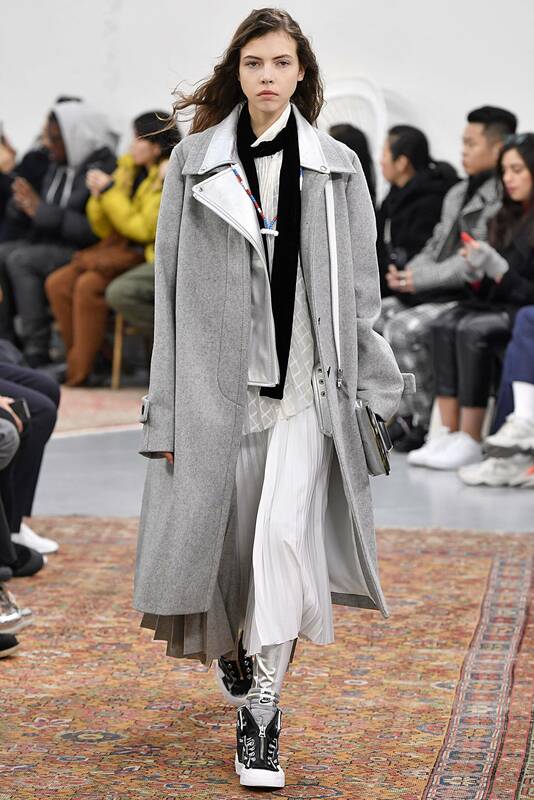 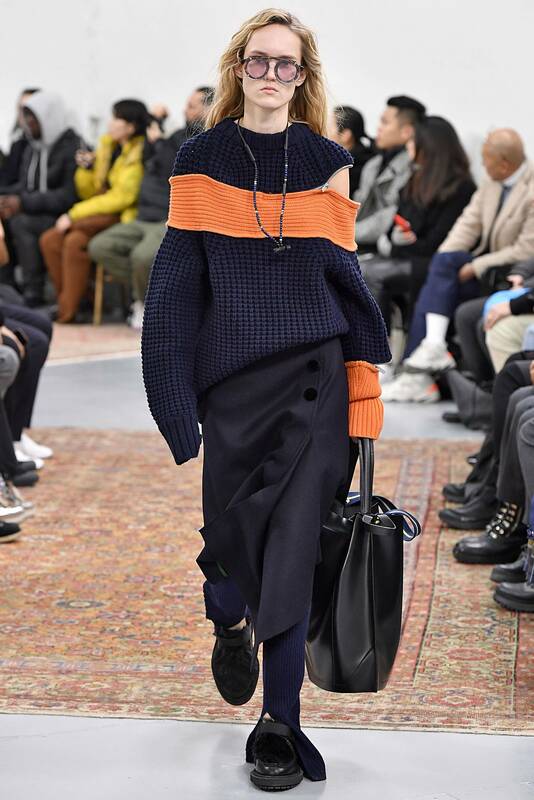 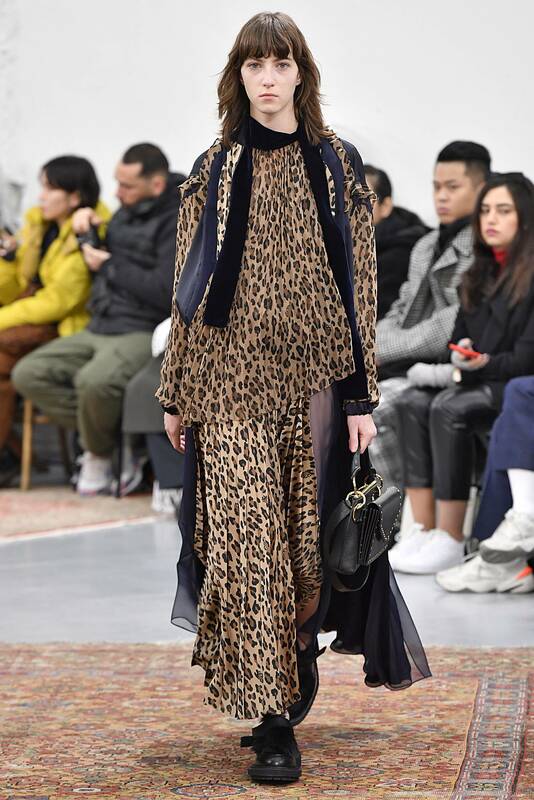 Inverting the importance of “dressing to belong” sacai-style, juxtaposing references in celebration of the idea that we should have the freedom to be different, to be an individual. 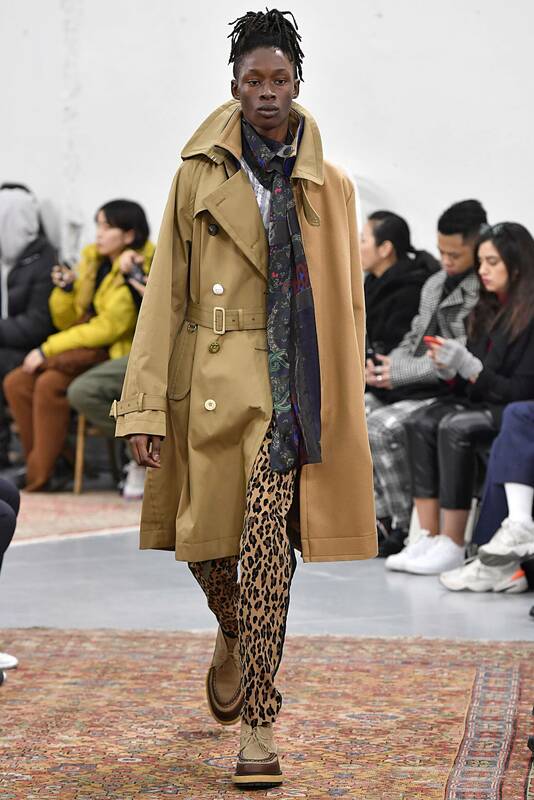 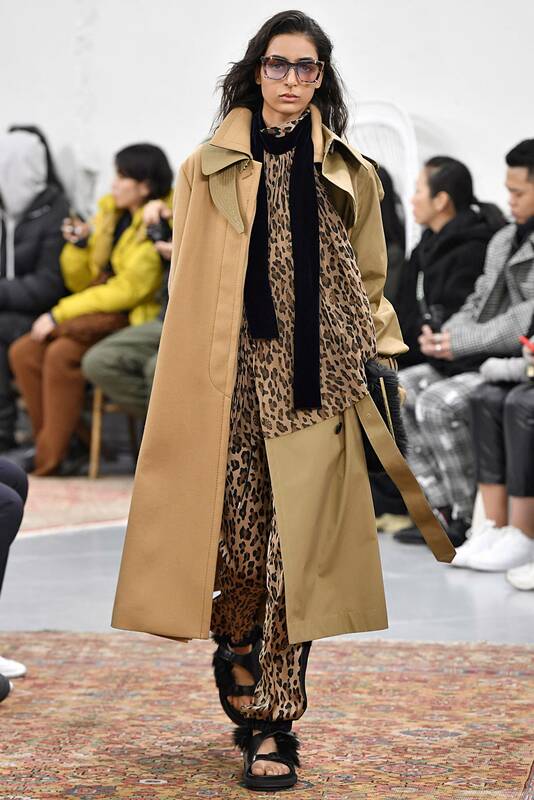 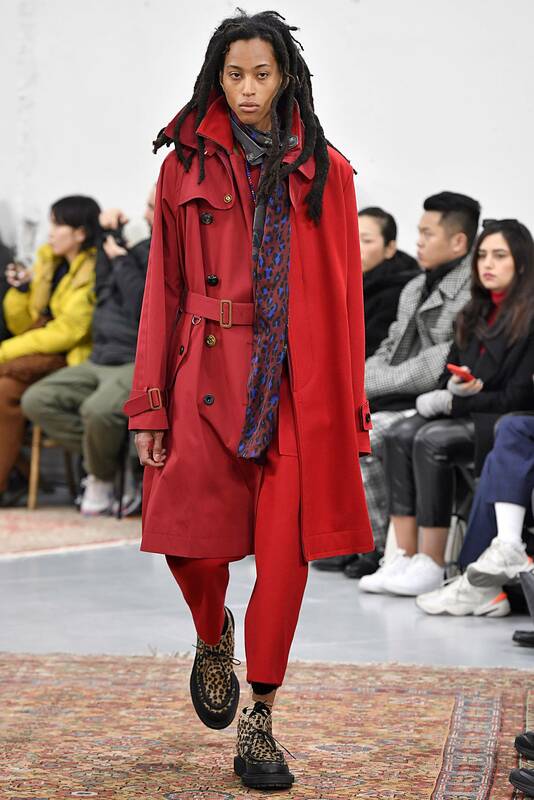 The familiar formality of a trench coat, subverted with leopard print; classic flannel pants hybridised with performance leggings; a single breasted suit tailored from sports performance fabric. 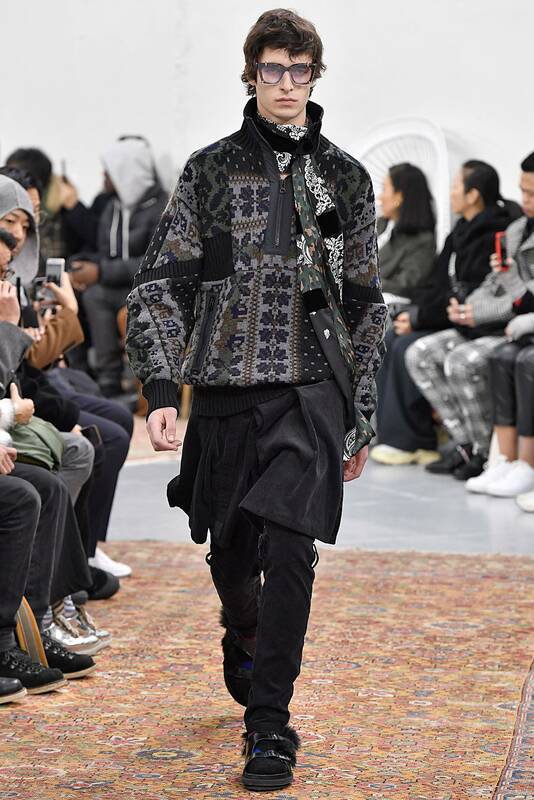 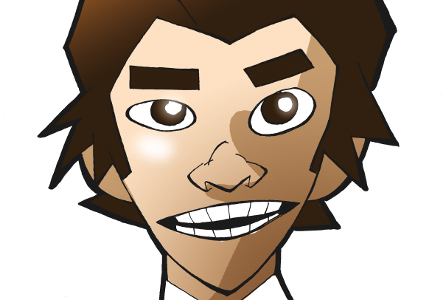 Playing with silhouette through construction and disrupting the layers associated with traditional outfit building. 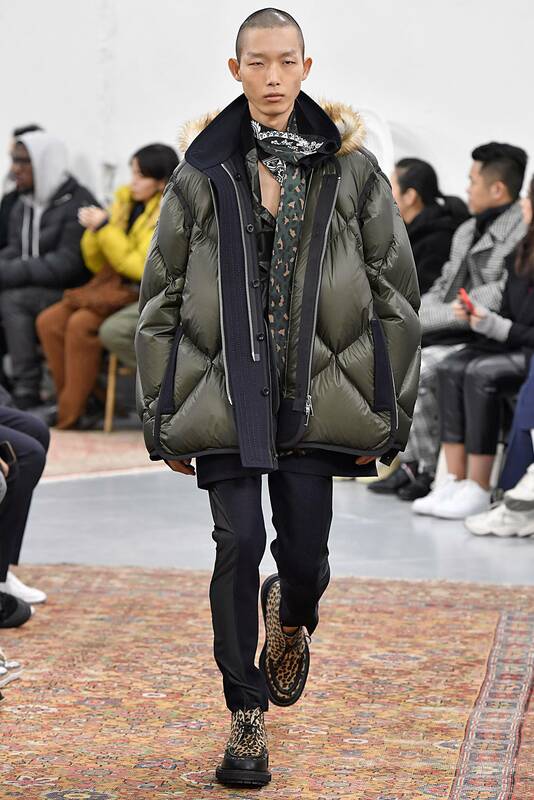 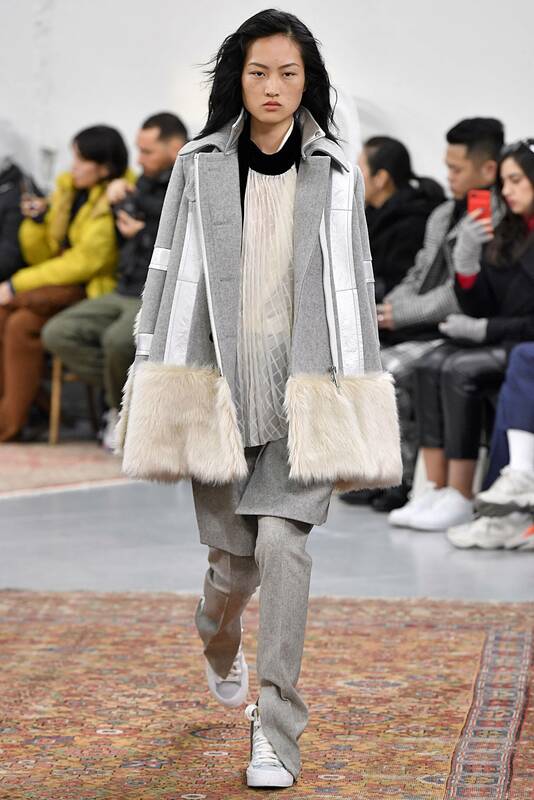 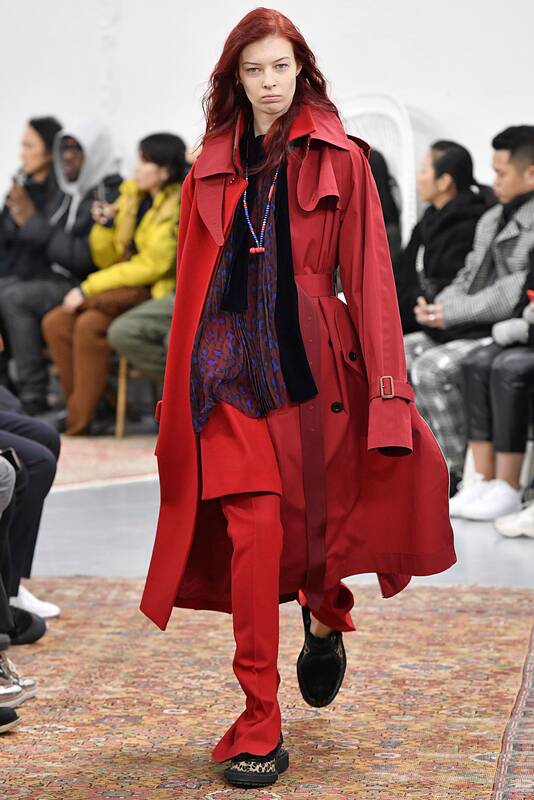 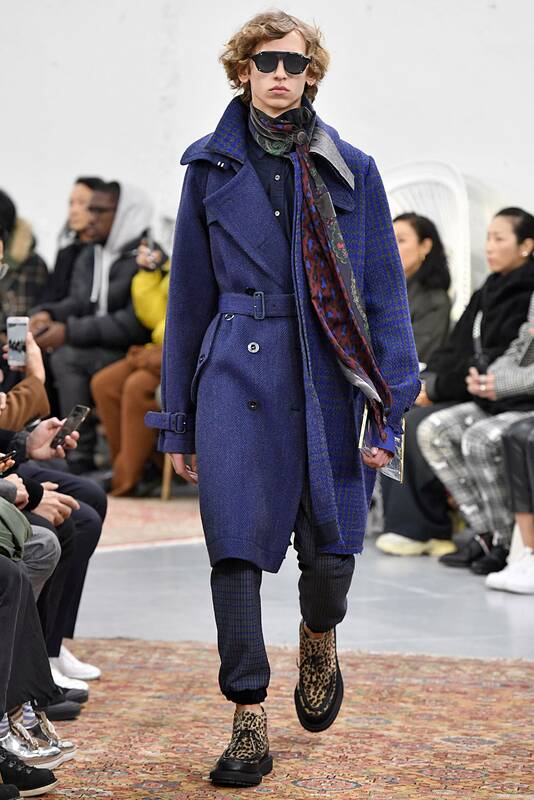 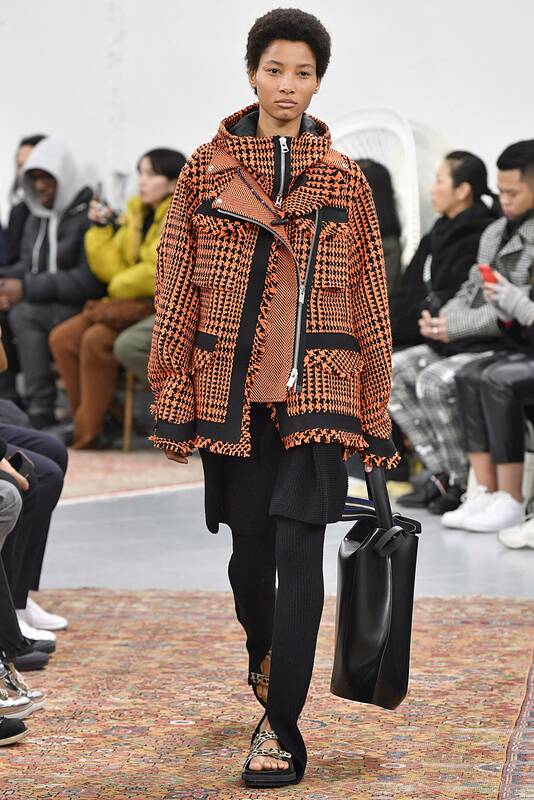 Inverting coats so that the liner becomes a pumped up outer layer; a sweater traditionally worn under a jacket instead becomes its outer shell; a college scarf integrated into a primitive jacket becomes the detail that entirely changes the silhouette. 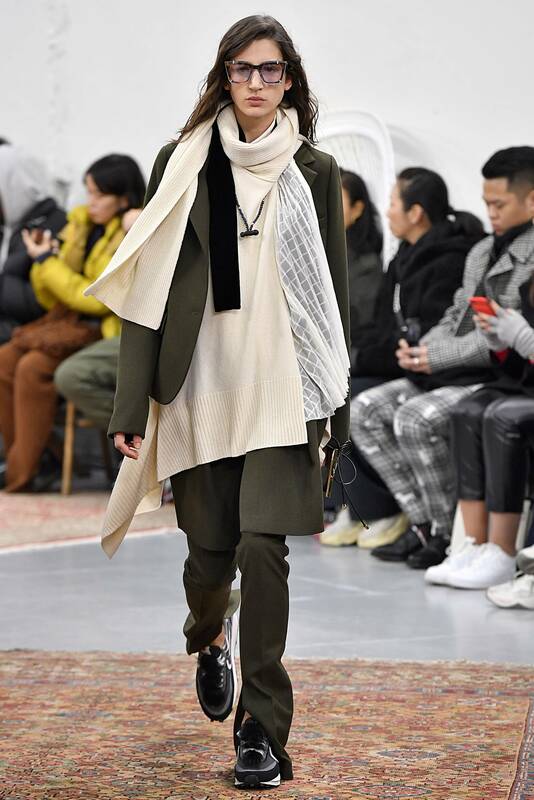 A feminine blouse is left undone, save for its scarf which serves to make a new shape and proportion. 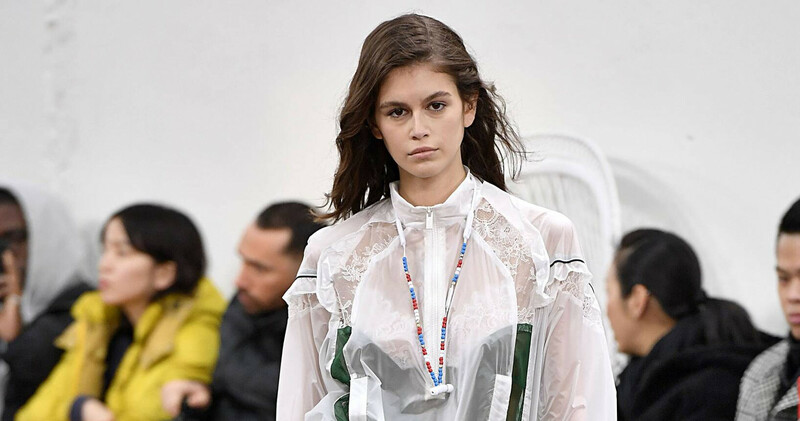 Mixing the utility of sports fabrics with the femininity of tulle and lace. 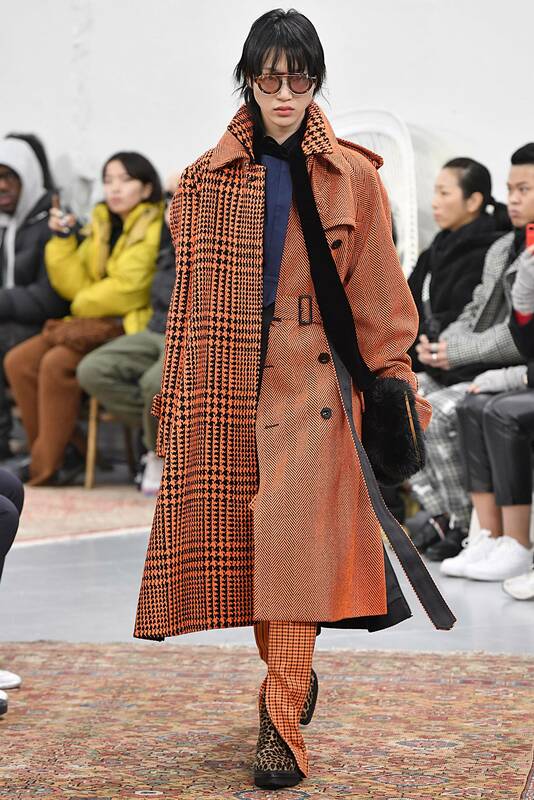 Houndstooth spliced with herringbone; ladylike tweed with biker. 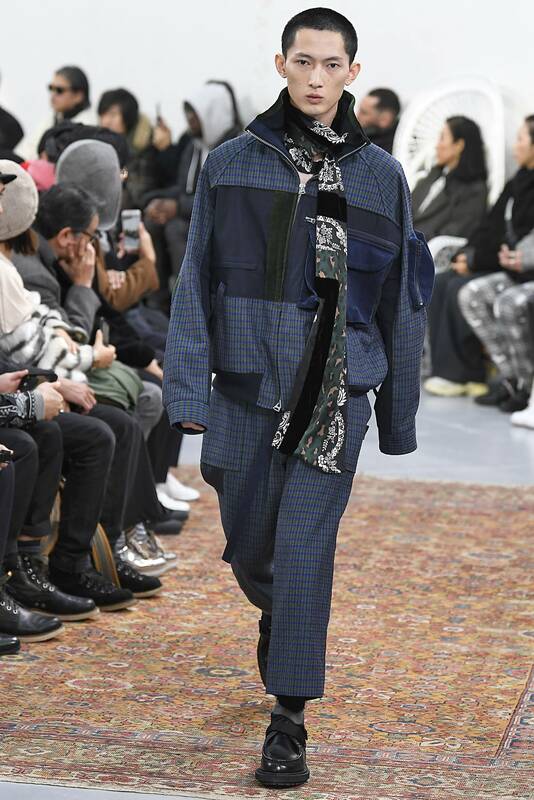 Sacai eyewear by NATIVE SONS adds a new dimension to a familiar form. 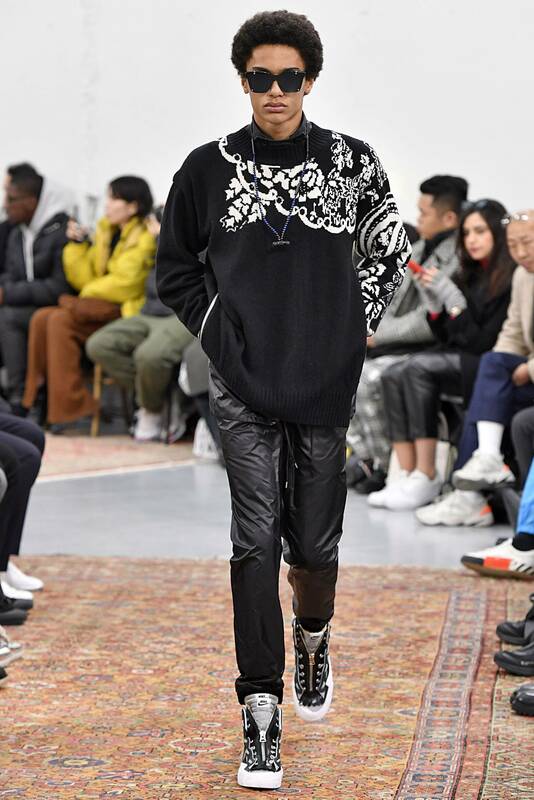 Custom beaded-designed Beats X wireless earphones by audio brand Beats by Dr. Dre. 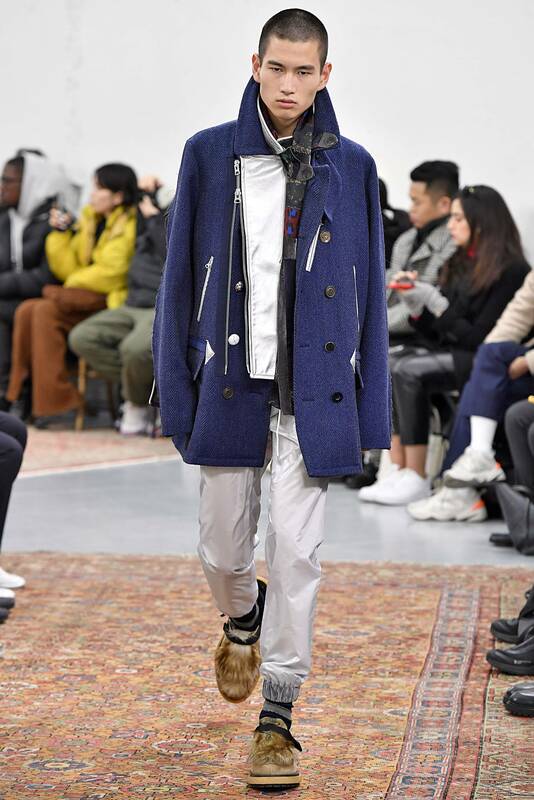 Nike x Sacai LDV/Daybreak, Blazer/Dunk – two hybrid styles in a new monochrome palette. 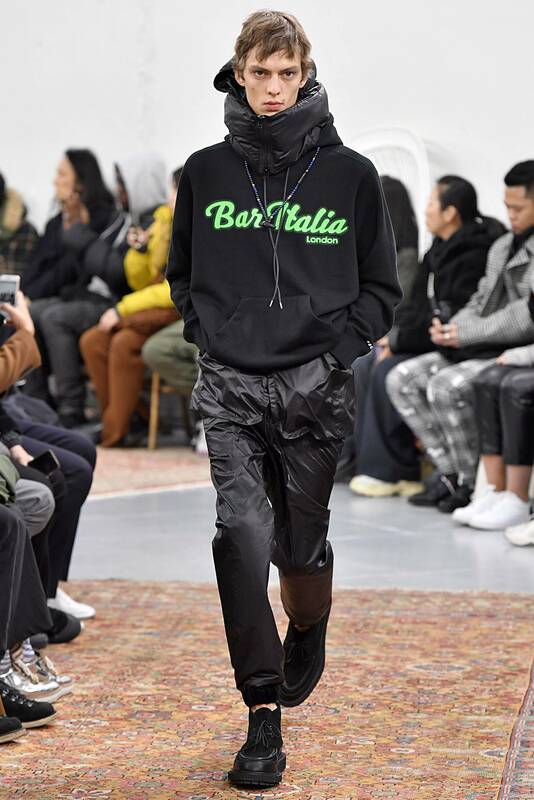 Bar Italia x Sacai tees and hoodies.